Background: For the past seven years, much of my work had involved traveling with the Pittsburgh Pirates production team for KDKA-TV. 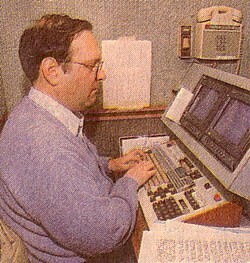 Tom Thomas, in the production room, types in the batting lineup, which will be added to the screen during the live broadcast. Thomas creates all of the type used during the night. However, nothing lasts forever, and KDKA's Pirates coverage came to an end. 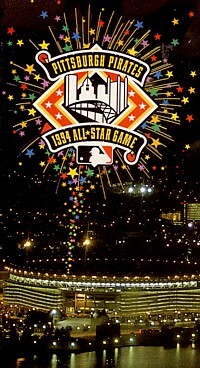 Starting in 1994, I had more time to work on other events. And I also had time to write letters about a Rust Belt town, blood pressure, Bach music, and rock and roll. I ran into Mark Zeman in Richmond this past weekend when I was doing Infinit for the "Pontiac Excitement 400" on TBS, and he gave me a copy of the "NBA on TNT" playoff schedule. Since it's that time of year, I should give you some idea of my schedule for the period of April 28 through May 27. This year, I'm not expecting to travel with the Pittsburgh Pirates. KDKA-TV did not renew their contract, so all the televising will be done by the KBL cable network, which in the past has traveled only one person (producer-director Dennis Galloway). I'll do some home games in Pittsburgh, but so far the only date definitely on my schedule during your playoff month is Tuesday, May 24. I also have a cycling event scheduled in Pittsburgh on Sunday, May 8. Aside from that, I've been alerted by Unitel that they may need my services for hockey playoff games in Pittsburgh, which could be scheduled for any odd-numbered date during your playoff month. A possible hockey strike would also affect the schedule. So I've ruled out fewer dates than usual, but there's a bit more uncertainty. As always: When your plans become more specific, give me a call, and we'll see what can be worked out. Thank you. 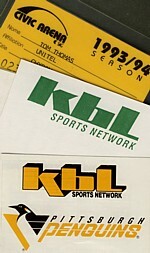 The local telecasts of the Pittsburgh Penguins hockey team had also moved from KDKA to KBL. Some were seen on a pay service called PenVision, produced by the same TV crew. Then KBL became part of the Prime Sports network of regional sports channels. Prime was later acquired by Fox; its name was changed to Fox Sports Net and then just FSN. As the logos kept changing, we had to get new stationery and apparel every six months or so. Before we became Fox, we were free to design our own graphics, so we did. The executive producer wanted lots of colors, so we gave him lots of colors. Also, I had recently attended a Chyron class and learned how "transforms" could animate logos and such, so logos started flying! I made the sketch at the left, showing a possible Title Page animation. We start with CIVIC ARENA/PITTSBURGH on the screen, slide up the Prime Sports KBL panel with logos, and simultaneously use a transform to fly in the visitors team name from the left and the home team name from the right. On the address keypad, please ENTER THE 2-DIGIT NUMBER for the opponent's headshots. Thank you. I'm now control-reading to load the rest of my fonts. I've turned on "Turbo," set the clock function to a countdown M:SS blanked, and read the mix/effects presets and the function keys. To finish this startup, please PRESS "READ" to delete this procedure from F10. Lisa Cirincione called and asked me to call Chuck Motta of Chyron. He is sending a Maxine to WTRF-TV, Wheeling, West Virginia, for their election returns. It has only one channel and no video input, but is otherwise fully equipped, including Intelligent Interface. He asked me to call Gary Driespul, WTRF general manager. Gary (who used to work at KDKA and WTAE and lived in Monroeville) says they have a Chyron 4100 that they normally use, but for election returns they have merely pointed a camera at a computer monitor. When he joined the station, he wanted something better, hence the Maxine. I will report to the station at noon Sunday and work that afternoon with the Chyron/stillstore lady to get the Maxine prepared and (hopefully) interfaced with their computer. I may go back Monday if necessary, and of course on Tuesday (the day of the solar eclipse) for the election returns. 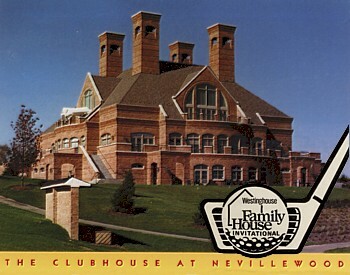 I again worked KDKA-TV's coverage of the Westinghouse Family House Invitational pro-am golf tournament, held this year at The Club at Nevillewood on May 23-24. We produced a half-hour recap of the day's action each evening at 7:30. And between your lines lurked a discouraging word. I trust now life is better. Some pains have abated. Just the way it was limping the last that I heard. Please pity my Image of you! It's still lumpy. Erase all the bumps that are no longer bumpy. Update the poor Image, before it gets grumpy! The murder of O.J. Simpson's wife was in the news on Tuesday, June 14, when my colleagues and I parked our cars at the Pittsburgh International Teleport and took a van to the Oakmont Country Club five miles away. There we taped a preview of the U.S. Open golf tournament. Temperatures were in the nineties. Fortunately, I didn't have to stay for the actual competition. Two days later, I was in Knoxville, Tennessee, preparing for the USA Outdoor Track & Field Championships on Saturday, June 18. While there, I joined the rest of the nation in watching O.J. 's low-speed Bronco chase on TV. At Major League Baseball's All-Star Game in Pittsburgh on Tuesday, July 12, I operated a video still store for the international telecast. My scorecard shows that Moises Alou doubled in Tony Gwynn with the winning run for the National League in the bottom of the 10th inning. On Sunday, July 17, in what might have been my last French-language telecast, I worked a roller hockey game en direct de l'arena Civic de Pittsburgh for the Canadian channel RDS. Wearing red, the Pittsburgh Phantoms with Bryan Trottier scored a 9-7 win over the purple-clad Montreal Roadrunners coached by Yvan Cournoyer. 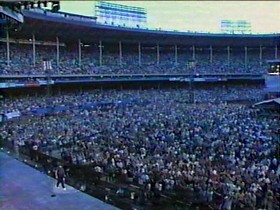 The arena's dome was opened during the telecast, the last time I remember that happening. 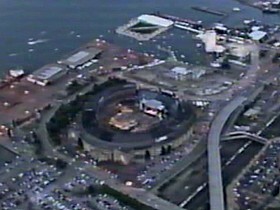 Subsequent improvements to the building (now known as Mellon Arena) have reportedly made it impossible to rotate the dome. I flew to Syracuse to give Adelphia Cable Communications some suggestions on the operation of their Chyron Max on August 17 and 18. WTAE has a 90-megabyte Bernoulli drive. We made a set of twelve machine fonts and put them in the PITT directory. Each is about 26% larger than the last (sizes 25, 32, 40, 50, 64, 80). Fonts 1-6 are from master font 5202 (Futura Bold Condensed), while their alternates, fonts 9-14, are from master font 5148 (Futura Extra Black). All have no edge. I too am somewhat underemployed at present. Thankfully, it's not due to spinal problems or management shenanigans, but rather to the salaries of professional athletes. The labor agreements in three major sports (baseball, hockey, and basketball) have expired. The players have been quite content to continue working indefinitely under the old agreements, under which their salaries have been increasing rather rapidly. The team owners, on the other hand, want new agreements that would put some sort of upper bound on salaries; otherwise they might find themselves bankrupt in a few years.  Baseball players went on strike on August 12. Nine games that I had been scheduled to work were canceled, along with the World Series. No negotiations are taking place, and the 1995 season is in question.  Hockey owners postponed their season, which was to have started a week ago. If negotiations are successful, they may start next weekend and make up the missing games; but should agreement never be reached, I stand to lose as many as 40 games.  Basketball owners were rumored to be planning to lock out their players around Thanksgiving, although the commissioner has denied it. Should the NBA season not continue, I would lose about half a dozen games there. So in a worst-case scenario, with all three sports out until next April, I would lose about $13,000 in income from all this. I'd be left with a few minor events and some college games (fortunately, the "student-athletes" in college sports have not yet organized into a union). But it would be a long and boring winter, and I would be very grumpy. In the meantime, though, I've explored some new territory around here. As one goes up the Allegheny River, one finds a different town almost every mile. Here on the northwest bank, Creighton is followed by Tarentum, then Brackenridge, then Natrona and Natrona Heights. I live in the "heights" section, a 20th-century suburban area on the bluff overlooking the 19th-century mill towns along the river below. Several times a week, I walk a little over a mile to eat lunch at a shopping mall with various restaurants and other stores. It's good exercise. 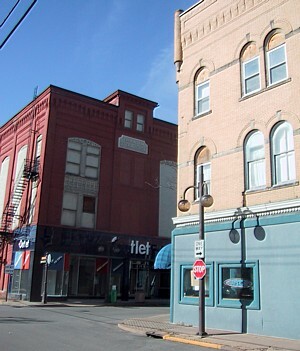 Downtown Tarentum is an equal distance in the opposite direction, to the south; it's one of the old towns down along the river. It too has stores and restaurants. I've been there on occasion, but until a couple of weeks ago, in my 14 years of living here I'd never walked the mile and a quarter to Tarentum. It's not a nice, neat neighborhood like up here on the bluff, but rather a small decaying Rust Belt town with a number of buildings that are vacant or underemployed. But recently, for variety, I decided to walk to Tarentum for lunch. And I did so in a spirit of exploration. This was good, because it led me to see the old place the way I would view such a town on a vacation trip. It reminded me of such out-of-the-way places as Calistoga, California, or Julian, California, or Breckenridge, Colorado, all quaint little Victorian towns surrounded by hills. So a closed and shuttered Tarentum business, which I would normally have scorned as a civic embarrassment, became a relic of the past. An abandoned, windowless hulk became a picturesque ghost building. Tasteless remodeling became eclecticism. Shabbiness became local color. 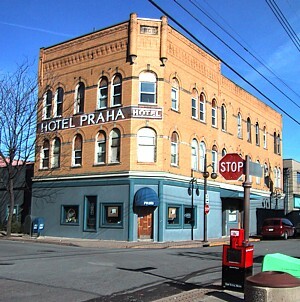 On one side of a downtown corner is the turn-of-the-century yellow-brick Hotel Praha (Czech for "Prague"), which I assume got its name because of the large number of central European immigrants around here. Across the street is the massive Tarentum Opera House, all its upper windows now bricked over and its lower floor converted to a drugstore. Local people probably aren't too proud of these reminders that their town is no longer as bustling and important as it was a century ago. But if I were a tourist, I'd be reading glowing stories about these landmarks and the people who were here long ago. 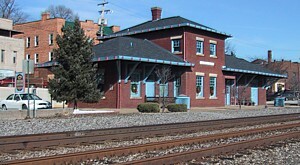 As a matter of fact, a couple of blocks away is a restaurant that used to be a train station; it boasts of such famous passengers coming through as William Howard Taft, William Jennings Bryan, and Carrie Nation. The trick is to look at your surroundings as if you're a tourist, and then the seedy becomes fascinating. After all, we all are just passing through. I had less than half an hour on the Max yesterday to experiment with the snow closings plan. Let me detail how far I got, and maybe you folks can take it from here. Let's suppose that you have exactly 100 schools and other organizations on your list of potential cancellations, and that you will reserve Max addresses 7800 through 7999 for school closings. The key to displaying the schools in alphabetical order is to pre-assign each one an address, say from 7801 through 7900, based on its position in the alphabet. If a school is canceled or delayed, that information will be in a single row recorded at its assigned address. But if a school is open as usual, its assigned address will contain no message at all. Our job then is to make the Max display the addresses that exist while skipping over those that don't. One easy way in which these rows can now be displayed is with a roll. You could also do a single-row crawl. However, what we originally wanted to do was to have three schools at a time appear on the template, then replace them with three other schools. I almost achieved this, but not quite. Shortly before 4:00 pm on Thursday, November 17, I was on US Air flight 386 on my way from Pittsburgh to Indianapolis. I was scheduled to work the next night's Supersonics at Pacers game on TNT. High above Ohio, I looked down from my window seat on the right-hand side of the plane to see whether I could find any familiar landmarks. Usually I couldn't, but this time was the exception. I spotted an interchange (1) that had to be Interstate 71 at Ohio 95. As the plane continued west, I identified (2) Mt. Gilead, (3) Cardington, Ashley, Norton, Waldo, Marion, Green Camp, Prospect, Richwood, Somersville, Byhalia, Mt. Victory, West Mansfield, and Indian Lake. I jotted down my accomplishment for posterity. Sorry about the delay in answering your letter of November 4, but it's been one thing and then another . . . .
Before that event could happen, ABC called back to ask if I could also do a football game from Tuscaloosa, Alabama, on October 22, so I went there. (The game was notable because it was interrupted by lightning for nearly half an hour.) They were pleased enough with my work that they sent me to Syracuse for another game on November 5, and they would have sent me somewhere else on November 19 had I not already been booked for TNT basketball in Indianapolis. The man sounded a little disappointed when I had to decline. About then I began coming down with what appears to be a virus. When I catch a cold, I don't always have the usual symptoms of sniffles and coughing and the like; I like to be original. For example, sometimes the first symptom is not a runny nose but a runny throat; I feel as though I'm ravenously hungry, but my stomach isn't growling, my mouth is watering. This time the symptom was spells of fatigue. Even very mild exercise, such as standing up, could cause my pulse to shoot up over 100 and my breathing to become heavy. There were no other symptoms, so I didn't know what was going on. Two doctors, including one at the emergency room of Methodist Hospital in Indianapolis, found nothing wrong  with one exception  so we assume that the problem is a virus. It's finally progressed to the stage where I have a little cough, a cold sore, and a few sniffles. These things tend to stay with me for weeks, so I may be draggy for a while. The one exception was high blood pressure, as high as 176 over 125. I'd been told that my pressure was borderline-high several years before, but it hadn't been checked since. My local doctor says that my normal EKG shows that we found the hypertension relatively early, and he's started me on extended-release nifedipine, 60 mg per day. My pressure is down to roughly 130 over 90, and of course further consultations are scheduled. 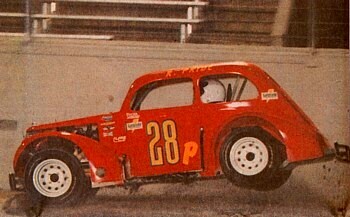 A miniature 1937 Ford in action at Daytona Beach Municipal Stadium in the Legends race that I helped televise on Friday, December 30, 1994. Good morning from downtown Torrington, Connecticut! I'm here for ESPN's coverage of the Memorial Day sports car race at Lime Rock, about twenty miles northwest of Torrington. 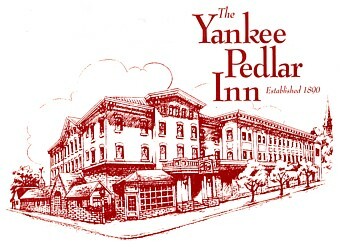 Eighteen of us on the TV crew are staying at this 75-room "inn," which is actually a partly-modernized old hotel. We arrived from various parts of the country yesterday. But due to a scheduling mixup, the big production truck with all the equipment that we're to use won't be here until tomorrow. So today, we get a paid day off! I needed a day off. For one thing, it gives me a chance to write (on this elegantly utilitarian stationery) a much-postponed letter to you. I had intended to write as long ago as February, but then the hockey lockout ended and the baseball players went back to work and my skills as an electronic graphics operator became much in demand. It almost makes me wish for the old, slow weeks of last winter, when I had more free time. In the last five weeks I've either worked or traveled (and sometimes both) on all but six of the 35 days. And these aren't any of your four-hour days, either; they average ten hours, not including any airplane flights that might also be required. So when I do get a day off, I usually don't do much. I've been postponing chores such as apartment-cleaning all spring. But my spirits remain high. I have it on the highest possible authority (to be cited later) that each of us men is worth nearly twice as much as each of you women. I had not heard that Signore Stradivarius made any instruments other than violins, violas, and the like. But if Kevin is playing a Stradivarius trombone, good for him! I had an ordinary Conn trombone when I was in sixth grade. I was starting to learn to play it when my optometrist warned that it would be bad for my eyes. I think he was worried about how my football-shaped myopic eyeballs would be affected by the pressure of blowing on a wind instrument. I never heard anyone else voice that concern, but anyway we sold the trombone, and I got off the "marching band" track and onto the "statistician for the sports teams" track, which led indirectly to where I am now. (That is to say, in Connecticut.) I still remember what it smelled like to open the trombone case and take out the Conn and its bottle of slide-lubricating oil. My interest in music is more superficial now. The piano I play only for my own amusement. Lately I've been experimenting with some Bach keyboard music. Most of it is too difficult for me to play at the intended tempo, at least not without more practicing than I care to do. So I've been taking liberties. For example, the second bourrée from the Overture in the French Style (BWV 831) is a rapid little dance in two voices. If I play it much slower, with a lot of rubato and strong phrasing (including many two-note phrases), Bach's sprightly melody becomes a heartfelt, emotional song in B minor. Open Link in New Tab. For other audio, click here. I recorded the bourrée this way on a Yamaha keyboard, March 26, 2006. Now, for our Old Testament reading, let us turn to the book of Leviticus, the twenty-seventh chapter, beginning with the first verse. This is the "highest possible authority" mentioned above. Should we need such a list, I suggest the following mnemonic key assignments, with the large and small logos of the hockey teams in caps and lower case and the flags in alt-lower case. 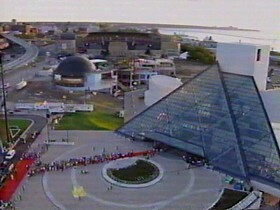 Since I wrote you last, my most notable activity has been working at the dedication concert for the Rock and Roll Hall of Fame in Cleveland. 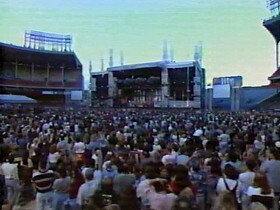 Little Richard was scheduled to perform in the first hour of the show, but that would have been before sunset. (Remember just three months ago, when the sun was still shining at 8:00 in the evening? How quickly things change.) Apparently he had religious convictions that precluded performing before the Sabbath was over, so his act had to be rescheduled for several hours later. That caused a lot of difficulty with the stage crew, who already faced huge logistical problems in getting dozens of bands on and off the revolving stage. As a result, after 2:00 AM the show kind of fell apart. 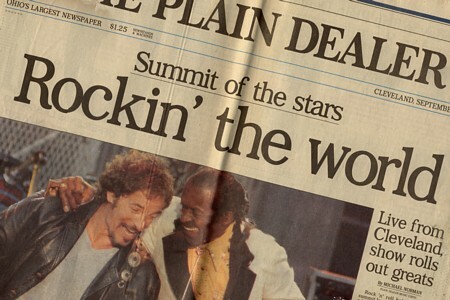 Several artists performed "covers," singing songs that had been made popular by others. One cover that I thought was an improvement on the original was "Love Child," with Melissa Etheridge giving it a much grittier emotional edge. The 60's Motown version with Diana Ross was too cool and polished, considering the lyrics. 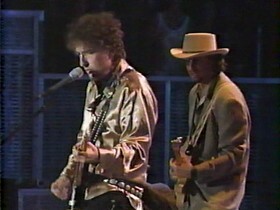 Bob Dylan, as befits his status, received special treatment. The TV crew knew he was coming (just as we know who's going to win a WWF wrestling match), but this wasn't supposed to be public knowledge. 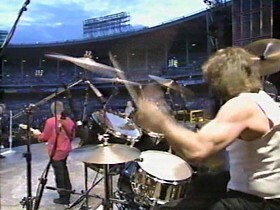 Unlike the other performers, he didn't do a run-through on the stage the day before. His part of the script was marked "To Be Announced." (As a result, I still don't know the name of one of the songs he sang; Dylan's enunciation has been pretty poor that past couple of decades, so I couldn't make out many of the words.) And we were instructed to avoid tight closeups that might show his age too much. I didn't know that much about Bob Dylan's music while we were in college. I think he might have been bigger in your sister's generation, but by the time we got there, the overriding influence was the Beatles. I do remember during my brief DJ career playing an atypical Dylan single called "Lay Lady Lay," plus some covers by other artists like "Quinn the Eskimo." But it's been only in the past decade that I've gone back and gotten acquainted with Dylan, especially his work from the 60's; I'm gradually acquiring CDs of those albums. It's music that I can listen to many times. Another multi-hour show on HBO recently was the annual Comic Relief benefit for the homeless. I didn't work on this event, only watched part of it, but I was struck by a similarity between it and other telethons that I have worked: the use of pathetic children. Usually I think of homeless people as bag ladies or winos, solitary adults with emotional problems who prefer living on the streets to being restricted in buildings. Comic Relief didn't talk about these people much; instead, in their film clips they showed us impoverished families who couldn't afford housing. And in these clips, most of the time the camera was on the children. The producers knew that the most effective way to get our sympathy was to show unfortunate innocent kids, not their parents (whom we might somehow blame for not holding a better-paying job). At times it almost seemed that the benefit was for homeless children, not homeless people in general. It's the same way with other fund-raisers. The Muscular Dystrophy telethon focuses on "Jerry's kids," not adult victims. A diabetes telethon I once worked on was for juvenile diabetes. The Easter Seals Telethon and the Children's Miracle Network Telethon tug at our emotions by bringing out crippled children just before they ask us to give. Here in Pittsburgh, the big fund-raiser this time of year is for needy kids at Children's Hospital; no one asks if there are also needy patients at Allegheny General Hospital, for example. Speaking of old folks, my father is 86 now and still living alone, although it's becoming more difficult. His walk is now a shuffle, so he can't move very fast or very far, and he's decided he shouldn't drive after dark any more, so he spends most of his time sitting in the house. A former employee who recently has been cutting his lawn and doing odd jobs for him has moved to another town, and another friend is now in an assisted-living home in the opposite direction, so I'm sure he gets lonesome and a little bored. I try to drive over (about 200 miles) every month for a few days, but he worries about my being out on wintry roads, and my schedule the next few months doesn't have any gaps longer than a couple of days. The college basketball season is heating up. There are also hockey, NBA, and World Wrestling Federation events on the calendar, making a total of 54 working days in 29 different cities in the three months from mid-December to mid-March. Tomorrow there's a women's basketball game up at Penn State, followed by pro basketball Friday in Cleveland and hockey Saturday in Pittsburgh. Then I'll be in Lawrence, KS, Tuscaloosa, AL, Durham, NC, and Evansville, IN, all in one week. A book arrived last week, a book that I apparently ordered a year or two ago: the Oberlin College 1995 Alumni Directory. Looking through it, it appears that most people from our generation are in a fairly stable period of their lives right now. I've been at this same address for 15 years. Nancy Huysman Rife is still a homemaker in Michigan. Christopher Rouse, whom I knew as an enthusiastic classical-music host at WOBC, is still a professor of composition at the Eastman School in Rochester (and a well-regarded composer, too, I hear). Michael Barone's organ show Pipe Dreams from Minnesota Public Radio is carried here in Pittsburgh on WQED-FM, where former WOBC chief engineer Tom Ammons still engineers. Others I remember from the radio station include Janice Derr, Ph.D., who runs a statistical center at Penn State; Jennifer Wagner, a business professor in Chicago; and Ted Gest, a senior editor at U.S. News & World Report. It's good to hear about all these folks, although of course I haven't had much contact with them since leaving Oberlin. Don't know what they're doin' with their lives. The end of the 1975 Dylan song quoted above. FOR THE NEXT THREAD, CLICK HERE.